Whether you’re ready or not, we’ve entered the holiday season. And as kids and adults alike sit down to write their holiday wish lists, it’s time for online retailers to start writing their promotional holiday emails. Email marketing is consistently one of the most cost-effective forms of online marketing, with an average return of $44.25 for every $1 spent, and while ecommerce businesses should be utilizing promotional emails year round, it’s especially important during the holiday season, but how do you Craft Great Holiday Emails for Your Ecommerce Business? However, there are also some holiday-specific practices that you should keep in mind if you want your emails to stand out in potential customers’ inboxes this winter. Here are a few tips to keep in mind. As you can see, the email uses a subtle holiday color scheme and a series of images reminding the viewer that the holidays are a time of giving. 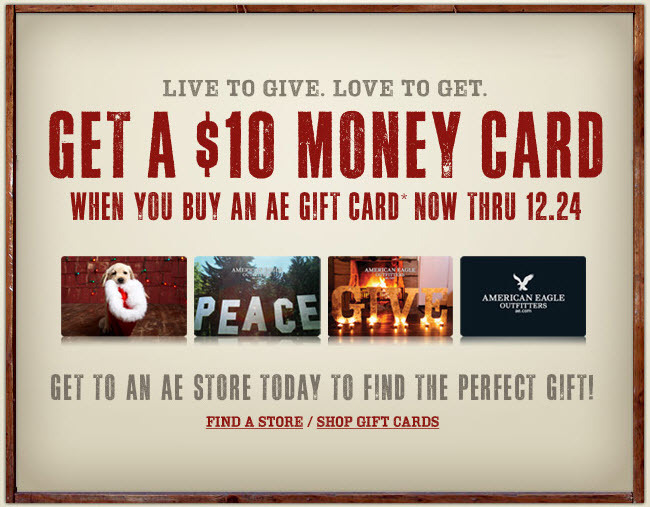 The primary call-to-action offers a clear incentive for viewers to buy an AE Gift Card, and the smaller call-to-actions below let the viewer click to go directly to the relevant web pages. It’s possible to find holiday email templates for free or relatively cheap that you can customize for your business, but for a truly unique and impactful look, you may want to hire a freelance graphic designer on a per-project basis (Freelancer.com and Guru are a couple of good places to look). Imagine this: a consumer receives an email with a subject line informing her about a 10-day holiday sale at an online store that she’s shopped at before. She opens the email but does not click any of the links because the 10-day sale is just starting, and she figures she can always return to the email later if she decides she wants to buy something from the store. However, the email quickly becomes buried in her inbox and she forgets about the sale. Your customers have a lot on their minds, so send multiple emails about special holiday deals so that your message isn’t lost. 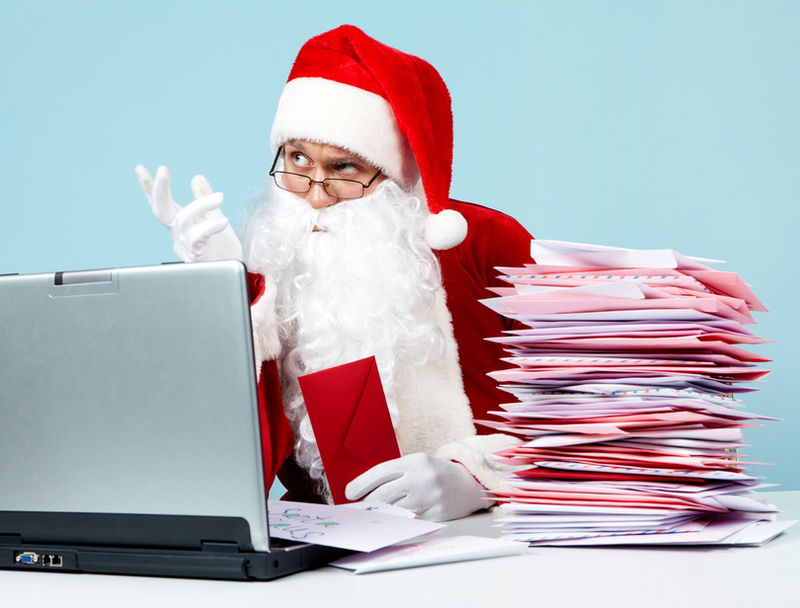 Don’t overdo it by sending a barrage of emails every day in December (this will likely cause you to lose email subscribers), but do be strategic and send 3-4 emails at key points during your promotion. You might start with an email that teases the upcoming promotion, then send an email to announce the start of the special deal (being sure to mention how long the deal lasts), follow up with a “Last Chance” email, and potentially send an email after that lets shoppers know that the deal is over, but that you have other exciting promotions/events coming up. You should always be thinking about making an emotional connection with consumers when crafting copy for your emails, but it’s especially valuable to incorporate emotional triggers during the holiday season. Rather than highlighting the technical benefits of your products, think about the direct benefits to the people who will be purchasing them. For instance, if you sell camping products, you might talk about how your tents will “make the perfect gift for the outdoor lover in your life.” If you’re selling a service, such as guided kayaking trips, you might focus on how purchasing a kayak trip as a gift will help the email readers and their loved ones create memories that will last long after all the presents are unwrapped. This is another practice that is best used year round, but it’s still worth mentioning. If you want to find out what subject lines, designs, and copy are most effective, send one version of an email to a small percentage of your email list (group A) and send another version with only one variable changed (e.g. a different subject line, but same design and content) to another small percentage (group B), and then track your metrics. Once you determine which subject line (or any other variable you’re testing) is most successful, you can send the “winning” email to the remainder of your email list. If you run your email campaigns using email marketing software, such as Mailchimp, you should easily be able to select what variables you want to test and what metrics you want the program to measure. Sending out compelling holiday emails is an important part of preparing your online store for the holidays, but it certainly isn’t the only step. Look for my upcoming holiday post, in which I’ll talk in more detail about how to use holiday incentives to promote sales.